In the late 19th and early 20th centuries pulp fiction magazines appeared and quickly gained popularity, particularly because of their low price. Their label came from the low quality paper on which they were printed, which cut down on costs. They covered adventure stories, westerns, and many more subjects, but there was a hungry readership for the science fiction magazines. One of them, at least, is still running today: it has had several names, the most well known being Astounding Stories, then Astounding Science Fiction, and the present day Analog: Science Fiction and Fact. It was founded in 1930 under editor John W Campbell, who demanded a high standard of work. 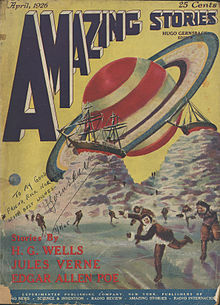 Amazing Stories magazine was founded in 1926 and had a turbulent career, with periods where the quality of writing was poor or the magazine was full of reprints (which weren’t paid for). It was the first magazine devoted to science fiction. It eventually finished in 2005, but appeared as an online magazine in 2012. The Magazine of Fantasy and Science Fiction was founded in 1949, and is also still publishing today, usually referred to as F&SF. 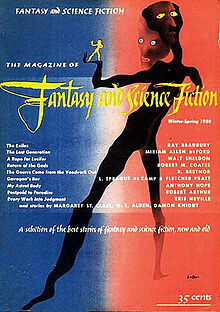 If magazine was founded in 1952 and ran until 1974, when it was merged into Galaxy Science Fiction. The complete set of If magazines is available to read online at the Internet Archive. 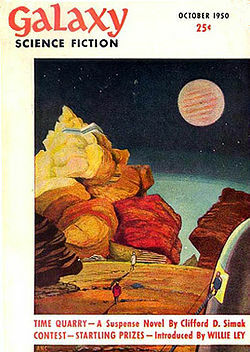 Galaxy Science Fiction magazine was published from 1950 to 1980. At its peak, Galaxy greatly influenced the science fiction field. Its first editor, H L Gold, made it one of the leading sf magazines almost from the start, and its influence did not wane until editor Frederik Pohl's departure in 1969. It is also available in the Internet Archive. The magazines gave a start to great names like Isaac Asimov, Arthur C Clarke, and Robert A Heinlein. This is where I come in. I was born in the 1950s, and magazines and comics are what I cut my science fiction teeth on. Authors such as Asimov, Heinlein and Van Vogt are the foundation of my science fiction, and I always think of them first, even though I read later authors too. I delight in discovering new authors, but they always have to measure up to my foundation.